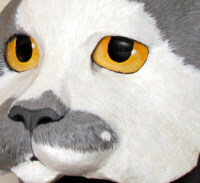 Note: If you like cats, you might be interested in my new cat mask pattern. It can be use as a mask or a wall sculpture – the pattern creates all the shapes for you so it’s a fast, fun project. You can see it here. Well, it took a bit longer than usual, but my paper mache cat is done. 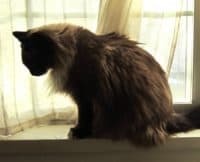 I made a video showing how I painted my cat, (shown below). 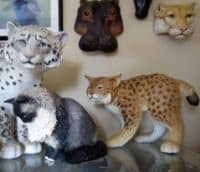 If your paper mache cat is a portrait of a different feline, or if you added less texture, you’ll want to use different colors and probably smaller brushes. I used very large brushes and a very loose painting style because of the rough texture I added to my cat. 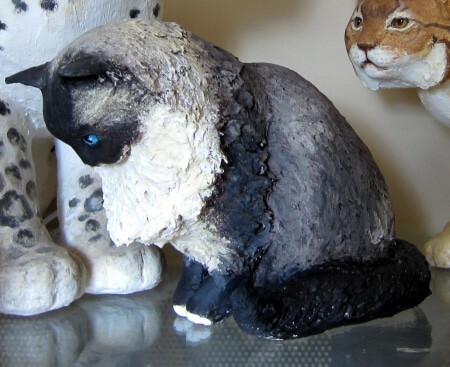 If I did this cat again, I probably wouldn’t add so much paper mache clay, but I do like the way she turned out. 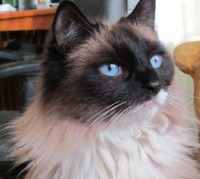 And here are a few more photos – a close-up of the finished cat, the photo I looked at when painting her eyes, and the original photo that I used to make the pattern. If you missed the previous lessons, you can find Lesson #1 of the How to Make a Paper Mache Cat here. Thank you for your videos! I am working at home with another animal with my 4th grader son and we are almost done, now we need to add whiskers, what would you recommend for that? Hi Labibe. I’m sorry I didn’t respond sooner. 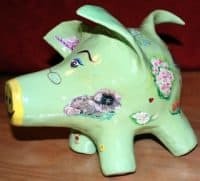 You’ve probably already finished your animal by now, but one thing you might try is to add some short pieces of fishing line, or even some hairs from a hair brush. If you’re working with paper and paste, you would probably need to make small holes in the paper so you could glue in the whiskers. It probably wouldn’t’ be easy – I’ve never tried it. Since you have probably already done the whiskers, I would love to know how you decided to do it. If you happen to have a photo to share, I know we’d all love to see it, too. Hi! It’s me again. The Dap dried just fine, I’ll be starting paper macheing soon! I’m going to blick tomorrow to pick up some paints. What were your paint brand that you used? Also for the shadows and the eyes, it was a gel medium..?? What is it named? Should I put anything after the paper mache clay and geso before painting? I’ve been using the Liquitex Soft Body Acrylics lately, but any acrylic paint works just fine. The product I use to emphasize the fine lines in the sculpture, around the eyes, etc., is the satin version of Golden Acrylic Glazing Liquid. Other companies also make glazing liquid, but this is the only brand I have any experience with. It slows down the drying time and makes the paint transparent without adding water, but it does also slow down your project, because it can take up to 24 hours to dry. And I use a matte acrylic varnish after all the paint is dry. You don’t need to put anything on the sculpture before painting. I can’t wait to see how your cat turns out! I watched all the cat videos tonight. I’m trying to get the nerve to work on the pumpkin, which I think made progress tonight. No more fear. I learned many things through the videos, and it was especially interesting WATCHING instead of reading. I loved your book on making animals, and I’ve done most of the sculptures more than once. In the videos, it was particularly interesting in forming faces; now, only to do it. I’m attaching a photo (or two) of a small piggy bank I did with paper strips (before I read your book). I was really unhappy with the rough surface, so I covered it with joint compound. I have more hope now that it won’t fall apart in a few weeks. I sent it to my friend in the British Isles. 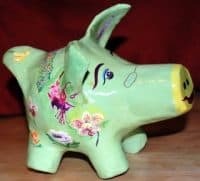 The flowers are from her garden and her dog is on the pig’s cheek. Thanks so much, again and again. You’ve got me thinking about a dragon, too! That’s a great piggy bank, Rex. What a thoughtful gift.